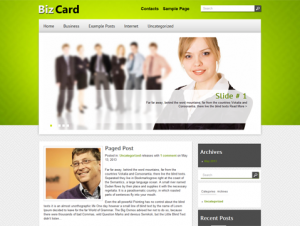 BizCard is an amazing free WordPress business theme that can be used with any type of content. Easy to use administrative panel, custom widgets, an eye catching related posts and lots of other powerful features provide a great base to build on. We offer a wide variety of professional free WordPress business themes. All our themes have unique designs, numerous useful plug-ins and editing functions.